Poultry litter, Clean shavings, Stockpiled lime, Fertilizer, Gypsum, Compost, Dewatered sludge, Water treatment lime, Lime-stabilized sludge, Mulch and more. The BMS15 is 20’ long and 94" wide that carries a 15 ton load. 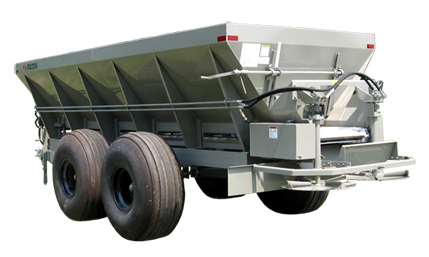 Plus, Stoltzfus spreaders are the ones "built like a tank." Many Stoltzfus spreaders are still hard at work after 20, even 30 years. Just think what that means for resale value. Compare the materials and workmanship. Compare the design and performance. Compare the reputation. Then you’ll know what makes a BMS15 one of the best investments you can make.